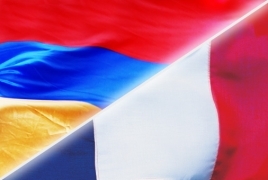 The Turkish protest of a French decision to declare April 24 a day commemorating the Armenian Genocide of 1915 has spread to bilateral military ties, Yeni Şafak reports. Turkish National Defense Minister Hulusi Akar on Thursday, April 11 spoke on the phone with his French counterpart, Florence Parly, to voice his displeasure at the decision, said the National Defense Ministry. Separately, Turkish Foreign Minister Mevlut Cavusoglu and his French counterpart Jean-Yves Le Drian also spoke on the phone, said Turkey's Foreign Ministry. No details of the conversation were released. Earlier on Thursday, Cavusoglu dismissed the declaration as "invalid," adding that "France should look to its own misdeeds in colonial Algeria instead of criticizing others."